What is the selection process for GEP? Is it reliable? If my child has a high IQ, will he/she pass the test? What can parents do to prepare their children for the test? Any past year papers? What is the selection process for GEP? Screening assessment for gifted elementary students is conducted by the Ministry of Education. The GEP selection consists of two rounds of stringent tests. All primary three students are invited to take the first round of tests which are typically held in August. The second selection test will be held in October for pupils who managed to clear the first round. Mathematical Reasoning which tests the child problem solving skills and ability to solve novel problems. The second round assesses the child’s suitability for the GEP. The child will need to display exemplary English and Mathematical abilities. For English, the test questions cover areas such as verbal relationships, sensitivity towards words, analogies, etc. For Mathematics, the child’s spatial, visual and logical skills will be tested. Is the GEP selection process reliable? The two rounds of tests are designed to identify intellectually gifted students who are suitable for the gifted program and are considered very reliable based on our experience. My child has undergone a psychometric test and has a very high IQ. What are his or her chances of getting into the GEP? 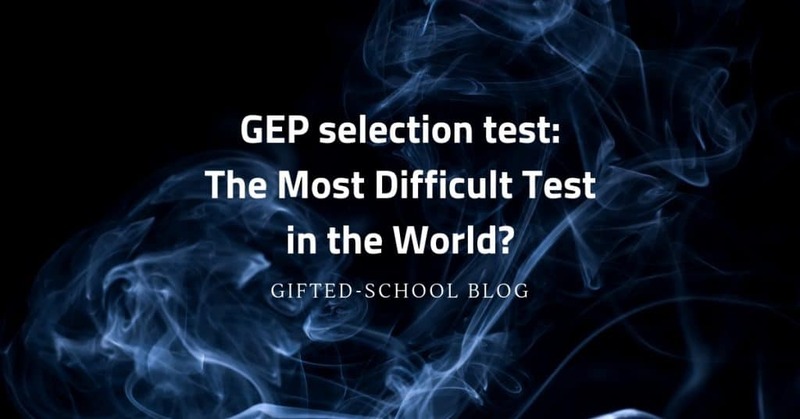 The GEP selection process is multi-faceted and is NOT the same as an IQ test. IQ is just one indicator. There is no guarantee that your child will be able to get into the GEP just because he or she has a high IQ. The GEP tests are crafted to also suss out other factors such as your child’s self-learning capability, English ability and whether he or she is the right `fit’ for the program. IQ and strong academic results are no guarantee of being selected for the GEP. Who then, might be intellectually gifted but unable to qualify for the GEP? As English language testing forms a component of the GEP selection process, pupils with poor English skills may not qualify. This is seen in students who may have no problems with gifted math but who may struggle with English because it is not their first language. If IQ is not the be all and end all of getting into GEP, what types of pupils are able to get into the GEP? GATE has looked into the profiles of pupils who have managed to qualify for GEP and identified two groups. The first group consists of high achievers who display excellence in all domains of their lives. They are driven, highly-intellectual and able to succeed in school, be it academically, or otherwise. The second group is what we call the dreamers. This group of pupils may have inconsistent or average results but display exceptional proficiency in the areas they are passionate about. Perhaps they are gifted in visual spatial reasoning, voracious readers, dabble in number theories or are highly creative and innovative. If my child’s academic performance is always average in class, does he have a chance to get into the GEP? Some students may not be the top academic scorers in their schools but may be chosen for the GEP. Why is this so? Because some intellectually gifted children are not interested in topping their school exams. They see the pursuit of knowledge as an end in itself and not the means for obtaining good test results. What can parents do to prepare their children for the GEP selection tests? This answer may come as a surprise, but in short, the answer is: nobody can prepare a student to pass the GEP test if the child is not intellectually gifted. What do we mean? Well, there is a misconception regarding the GEP selection test. The test is designed to identify the top 1% intellectually gifted children. Parents believe that the child can prepare for the selection process. However, the test is highly reliable and accurately identifies this group of children. If your child is exceptionally gifted, one thing that needs to be done is to ‘unlock’ the child’s potential through a differentiated curriculum that maximizes your child’s exposure to cognitive and reasoning skills. Early exposure to a differentiated curriculum will unleash the potential of a gifted child to the fullest. There must be some way for us to prepare our child for the test. Do you have any suggestions? Exposure is the key. An extensive vocabulary and critical reading skills such as predicting and inferring can be built up by getting your child immersed in the world of books. Spatial-visual exercises also improve your child’s logical reasoning. The daily activities that the child does at home are not exactly preparation for any examinations or enrolment tests but part of a long process of learning. Therefore making your child enjoy learning every day is paramount to his or her success. An enrichment programme which is catered to high ability learners with a focus on critical reasoning skills can be beneficial to the gifted children. Are there any past year questions or papers that we can let our child attempt before going for the selection tests? The questions in the selection tests are not released to the public. Test information is strictly confidential. As mentioned, there are ways to build the critical reasoning skills in your children through a structured and well-planned curriculum. As the child develops intellectually and his or her thirst for knowledge is quenched, he or she will naturally excel academically. We believe that every gifted child can be nurtured for success. However, it should not be through hothousing preparatory classes and overloading them with information. Should I let my child learn more advanced maths topics for upper primary students or do more vocabulary worksheets to prepare for the GEP selection process? The GEP tests only require knowledge of mathematics topics found in the primary 3 math syllabus. Knowledge of advanced maths topics will not aid your child in the selection process. The test focuses on complex problem-solving skills. Vocabulary worksheets that you will normally find in assessment books will not be especially useful for the test as pupils are expected to be able to understand vocabulary used in context and display critical reading skills. My child passed the first test but did not clear the second test. What can I do for my child since he or she failed to get into the GEP? If your child did not make it for the GEP, it does not mean that your child is not bright or lack any intellectual ability. Your child is still in the top 2% to 10% category of high ability learners which require differentiated curriculum. There are many other options available to your child. For high ability children, they can join high-ability classes in schools (many primary schools have high ability classes, or subject-based high ability classes). There are also ample opportunities for your child to study a subject at a high level. Don’t be disappointed or lose hope as your child will still be exposed to the curriculum he or she needs. Are there pupils who managed to qualify for the GEP, but do not enrol in the end? Every year, there are parents who choose to not let their child enrol in the GEP for a number of reasons. For many years, students who enrol in the GEP need not depend solely on PSLE scores to go to secondary school. However, in recent years, many GEP students need their PSLE scores for admission to their dream secondary school. As a result, some parents feel that there is no difference between the GEP and mainstream program and choose to let them continue in a mainstream school. At GATE, we do not think it is a wise decision to link the GEP to PSLE. The GEP is a special education programme to stimulate and inspire gifted learners. It should not be treated as the shortcut to a top secondary school. Others may worry that their child may not be able to adapt to a new school environment. Some feel that the GEP schools are too far away from their houses. What are the percentage of students who manage to qualify for the GEP? Every year, only 1% or less than 1% of students qualify. In our opinion, this is one of the most challenging tests in the world. What is the male to female ratio in the GEP? Based on our observations over the years and not on any official statistics, there are approximately 3 males for every 2 females. This does not mean that males are naturally more intellectually gifted than females. The tests rewards males who are risk takers when encountering novel problems. Male students at the age of 9 are more willing to try and guess, and therefore this is reflected in the male to female ratio of students. My child managed to qualify for gifted programmes overseas, such as in Australia or USA. Why did my child not qualify for the GEP? Compared to the Australian and USA tests, the GEP selection process is even more stringent. Only 1 percent of students in the primary cohort will be selected. Some gifted education programmes overseas are subject-based gifted programmes, while the GEP requires high aptitude in both Mathematics and English. The passing rate is much higher than the Singapore GEP. We have students who were enrolled in the Australian gifted programme or USA gifted programme. However, they were unable to get admission to Singapore GEP. It is common that every country, or even every school, to set its own standard for the admission to gifted programme. Can we prepare for the GEP tests? How to nurture your high ability kids to optimize his performance? Is GEP an elitist course? Follow our blogs for more exciting stories as we give you more insights on GEP and gifted education. Find out more about GATE’s regular programmes here!